Prof John Holmwood opened the Convention on behalf of the Steering Committee, explaining what had happened since the Second Convention, the Alternative White Paper and the campaign over the summer. This Convention included representatives of the NUS and colleagues from FE, and the discussion and debate reflected this. In the first session, Baroness Alison Wolf, Prof Martin McQuillan (Deputy VC, Kingston) and Malia Bouattia (NUS President) all spoke on the Bill, what was wrong with it, and which arguments were likely to be successful with MPs. Alison spoke about MPs’ perceptions of universities: high fees meant universities were booming at the expense of the taxpayer, teaching was not always high quality, so needed evaluating by market mechanisms such as the TEF, and that VCs and academics were perceived to be motivated by self-interest. These arguments needed to be countered. There was little recognition in Government that the HE Bill would undermine academic freedom – or what that might mean in practice. She reminded colleagues of the terrible situation in Turkey where Deans were being sacked and academics arrested. Martin talked about the VCs’ timidity in challenging Government. They were perceived by MPs as operating entirely self-interestedly in arguing for a rise in tuition fees, and they had lost a lot of credibility. With respect to the Referendum debate they had found themselves on the ‘wrong’ side in Government. The student loan system was bad for students, for taxpayers and for universities. He said that there was a fundamental problem of intergenerational injustice, as MPs who had free education were pushing the next generation into a lifetime of debt. Speaking for the National Union of Students, Malia spoke about the need to build an alliance with students and parents. The NUS has been organising against the Green Paper and the Bill, and the national officers have been speaking up and down the country to Student Unions to try to get them to take it up. The NUS is also consulting with SUs about a boycott of the National Student Survey (which the Government wants to use as a TEF factor). Students are expected to be complicit in awarding universities high marks for satisfaction, and thereby allowing them to raise tuition fees! In the second Q&A session, Lee Jones (QMUL) and Sherrill Stroschein (UCL) briefly presented a summary of what people needed to know in order to lobby MPs over the HE Bill. The TEF was technically outside the Bill, taking it out of Parliamentary scrutiny. Key arguments for lobbying Conservative MPs included the ‘dumbing down’ impact of the TEF, the growth in wasteful bureaucracy, and the threat to state finances. Private providers are not going to run expensive courses or niche subjects. We can predict a loss of courses in sciences (STEM) and languages. Are MPs ready for a Market Exit in their constituency, or affecting large numbers of their constituents? The market was generating apparently perverse outcomes. The Government wants students to study STEM subjects, but the biggest expansion is in Arts and Humanities (cheaper to teach and popular). London Metropolitan University represents a salutary lesson in what these market reforms mean in practice. Mark Campbell (London Met UCU) explained how the management of the University had restructured the college serially. At its formation London Met was a ‘widening participation’ Post 92 university. He quoted extensively from management statements – how if they were constructing a university from scratch it would be different – and that just this year a third of the permanent lecturers had been told they were being sacked to be replaced with casual staff on ‘zero hour’ contracts. Both David Hardman and himself (branch chair and secretary) had been made redundant in the previous round, a decision that appeared to be wholly about getting rid of people who would speak out. A combination of metrics and threats were being used to drive up formal contact time to 550 hours a year, leaving little time for staff to prepare classes or mark work. Despite having few PhD programmes, the university even planned to hire lower-paid ‘graduate teaching assistants’. The university had cut the campus from three sites to one and cut student numbers from 34,000 in 2002 to 12,000 today (the VC says 10,000 would be ‘optimum’). With an ex-Pearson executive chairing the Board of Governors, new capital projects and new-build student accommodation shooting up across the road, the idea that London Met is being groomed for take-over does not seem far-fetched. There was a lively session of over an hour where delegates split up into groups by region and share ideas. A Google Doc acted as a shared scratch pad which allowed people to jointly edit and summarise their own ideas, exchange contact details. In conclusion, Sorena Vieru from the NUS spoke about the NUS campaign and materials against the Bill. Their campaign, Quality Doesn’t Grow on Fees, emphasises the impact on current students of fee rises and the absurdity of the TEF quality metrics. 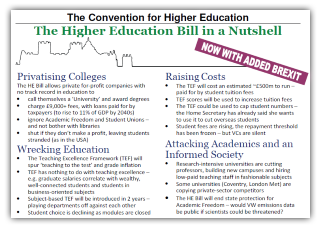 The NUS is very keen to work with the Convention to stop the Bill. Delegates agreed that the Convention will call a Lobby of the Third Reading of the Bill in the House of Commons. Convention representatives are already working with the NUS, UCU, CDBU and Gordon Marsden’s office in the Committee Stages. The Third Reading could be soon – in a matter of two or three weeks. The Bill will then go to the House of Lords, which will require further lobbying. Baroness Alison Wolf said that we should not be anxious about lobbying the Lords – they relied on people lobbying them to get information. Important Note: Even when the Bill has passed to the Lords, this does not mean we should not lobby MPs. MPs will get another vote on the Bill when it comes back to the House of Commons at the end of the process. 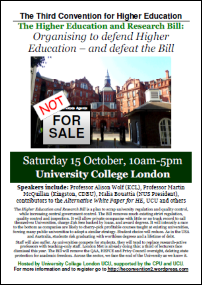 On 19 November, NUS and UCU have called a National Demonstration for Education. The Third Convention welcomed speakers from the NUS to talk about their campaign and to support the building of it. This unity needed to be carried through on the campuses against the Bill. The Convention also agreed a strong statement condemning the Home Secretary for suggesting that it was a good idea to limit international student recruitment to UK universities, and even worse – to use the TEF to do so. This entry was posted in event, HE BIll, Uncategorized and tagged alternative, CDBU, CPU, NUS, third convention, UCU, university. Bookmark the permalink.